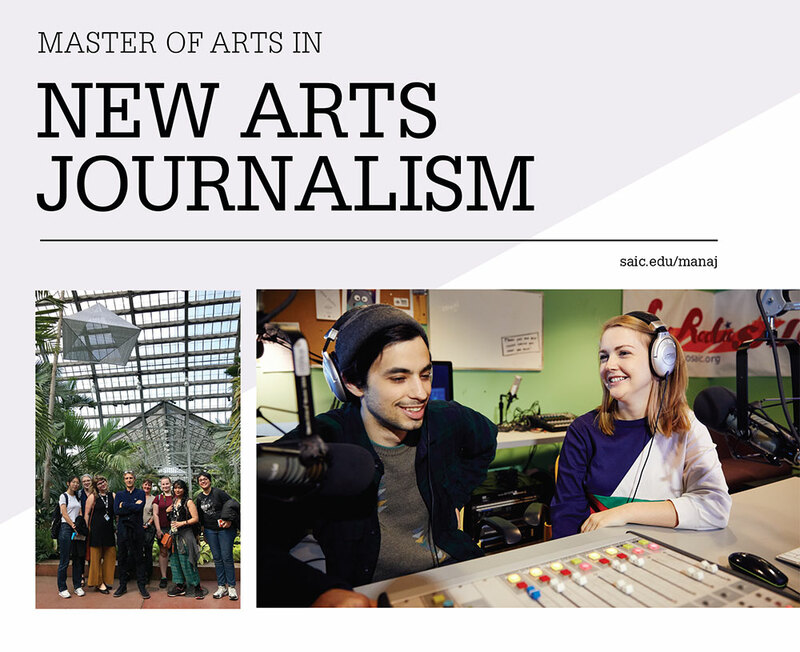 The Master of Arts (MA) in New Arts Journalism at SAIC is designed to provide students with the necessary skills and experiences to write about the arts for diverse audiences. Located in a vibrant school of contemporary art and design, the MA in New Arts Journalism program provides full engagement with the theory and practice of journalism as well as the opportunity to work closely with artists, art historians, cultural theorists, and art critics connected to a major American museum. If you are ready to apply to the School of the Art Institute of Chicago's (SAIC) Master of Arts in New Arts Journalism, you will need to first submit SAIC's Graduate Application form and then a corresponding ePortfolio for the New Arts Journalism department. ePortfolios are required for each additional program to which you wish to apply. All submissions happen via the software SlideRoom. Admission to SAIC is for the Fall term only. Write a 500- to 700-word statement that describes your work or research. Discuss how you came to focus on the medium, body of work, or academic area you wish to pursue at the graduate level. Also discuss future directions or goals for your work and describe how this area of study is particularly suited to your professional goals. Upload your statement of purpose to the Attachments section of your ePortfolio. Submit 10–15 pages of critical writing. You may submit a single writing sample or multiple shorter papers addressing topics in new arts journalism or contemporary culture. An interview is recommended for the Master of Arts in New Arts Journalism. Contact Dushko Petrovich at dpetro1@saic.edu prior to the deadline to schedule an interview. The 36-credit, two-year program is divided between four areas of study: writing (12 credits), production (9 credits), thesis (six credits), and electives (six credits). Elective courses are chosen in consultation with and require the approval of the New Arts Journalism Director prior to registration. Completion schedule: Students have a maximum of four years to complete the coursework and submit a final, approved thesis. This includes time off for leaves of absence. Thesis in Progress: Students who have not submitted a finished thesis for review and approval by the end of the final semester of enrollment are given a Thesis in Progress grade (IP). All students with a Thesis in Progress grade (IP) will be charged the Thesis in Progress Fee in each subsequent full semester until the thesis is completed and approved, and the grade is changed to Credit (CR). If the deadline is reached without an approved thesis, the grade will be changed to No Credit (NCR). SAIC's interdisciplinary ethos creates an ideal environment for the New Arts Journalism student to engage directly with artists, designers, and writers in order to develop an instinct for seeing the broader issues that underpin events in the world of contemporary art. Unlike other arts journalism graduate programs, SAIC is a thriving site for students to combine in-depth knowledge of the arts along with the study of the rubrics of journalism. The program helps aspiring journalists to refine their writing of reviews, essays, interviews, and feature stories, and examine the contexts of investigative reporting, the opinion piece, the documentary, and the critical essay in the context of art. Every student participates in at least one internship, which offers a valuable, hands-on experience working at a Chicago media venue. The concluding thesis may comprise a publication or zine, investigative journalism, an extended narrative, or original research. Click around the pages of this website for information on admissions and curriculum requirements, MA in New Arts Journalism faculty, students and alumni, and more.